The old guard had changed. General Joffre was replaced by General Nivelle as Commander in Chief in December 1916 and had been promoted to be a Marshal of France with no responsibilities. General Sir Douglas Haig was firmly in command of the expanding British Army after the 1916 Somme battles. General von Falkenhayn had been replaced as Commander of the German Forces and sent to Rumania in August 1916, being replaced by Generals Hindenburg and Ludendorff from the Eastern Front. On their arrival in France, they had been appalled by the slaughter of German troops on the Somme, following so closely on that at Verdun, and had instigated the building of the well designed and heavily fortified Hindenburg line away to the east of the Somme. This released much-needed German infantry divisions and had the added advantage of putting the new very extensive German positions on ground much more advantageous to the defenders than previously, in the light of the new policy of "defence in depth". The Hindenburg line was in some places approaching five miles of fortified positions. And now with the spring coming and the mud of the appalling winter fading, it was time for all the armies to plan their campaigns, each with a view to ending the war to the satisfaction and acclaim of their own countries. Who Were the Four-Minute Men? Of Scots-Irish descent, Paul Vories McNutt was born in Franklin, IN, July 19, 1891, the son of John Crittenden and Ruth Neely McNutt. His father then was prosecuting attorney of Johnson County. In grade and high school he was constantly in roles of leadership. In 1909 McNutt decided to enter Indiana University. After being graduated with highest honors from the university in 1913, McNutt entered Harvard Law School, where he obtained his degree in 1916. In the spring of 1916, McNutt entered law practice at Martinsville, IN with his father, but early in 1917 he was appointed to an assistant professorship of law at Indiana University. Then came the World War. Three of the six members of the law faculty asked for leaves of absence to enter service. McNutt was one of them. Uncle Sam utilized his organizing ability and teaching experience profitably in the task of giving proper technical instruction to the men who passed through wartime cantonments. Serving at Camp Travis, San Antonio; then at Camp Stanley, an old cavalry post twenty miles from San Antonio; as an inspector in officers' training school, and later at Camp Jackson, South Carolina, where the work of training a vast host of artillery officers and men was just getting under way, McNutt reached the rank of lieutenant colonel. After the war, McNutt was appointed professor of law at Indiana University. With him to Bloomington came his wife, the former Kathleen Timolat, whom he had married at San Antonio following a romance of army service. McNutt rose to state and national prominence rapidly after resuming his place at the university. He became known as one of the foremost advocated of an adequate national defense, and was active in American Legion affairs. In 1925 McNutt was appointed to the Ezra Ripley Thayer teaching fellowship at Harvard Law School, but before the leave of absence granted him became effective he was appointed dean of Indiana University Law School, an unusual honor at his age. At thirty-four he was the youngest dean of any accredited law school in the United States. 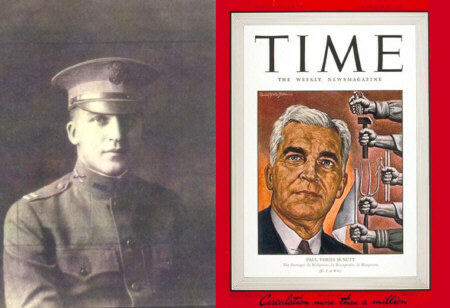 His advocacy for strong national defense won him to office of National Commander of the American Legion. Very active in Democratic Party politics, McNutt was elected governor of Indiana. Later his resume included service as U.S. High Commissioner to the Philippine Islands, service in the FDR administration and appointment by President Truman after the war as the first American Ambassador to the Philippine Republic. 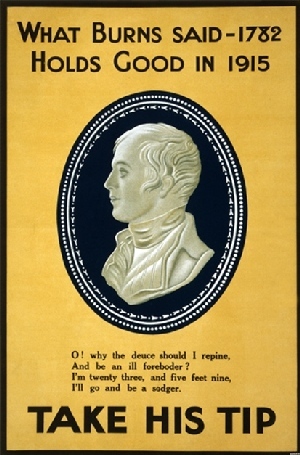 With Scotland's sons deeply involved in the war, the memory of Robert Burns was drawn upon for recruitment and inspiration. Scots-Canadian Robert Service, who drove an ambulance on the Western Front, contributed his own poem on the occasion of Burns's birthday. "Hae ye heard whit ma auld mither's postit tae me? It fair maks me hamesick," says Private McPhee. As he cockit his rifle and bleezed at a Hun. "The brawest big haggis I ever did see. Tae haggis and whuskey--the Birthday o' Burns. O' the lads, and we'll hae a Burns' Nicht wi' the best." "I want you two men for the List'nin' Patrol." "I'm thinkin', ma lad, we're confoundedly done." "I'm thinkin' auld chap, it's a' aff wi' oor spree." We maun hae a drappie tae jist haud it doon. O' the haggis that's waitin' ye when ye get back." And the deid they were rottin' on every hand. And the winds o' destruction went shudderin' by. Little fashed the twa men o' the List'nin' Patrol. Wis the thocht o' the haggis that waitit for them. Calamity's aften maist cruelly near. The Boches below them were howkin' a mine. The fuse it wis burnin' and burnin' away. A hell-leap o' flame . . . then the wheesht o' the tomb. "Haw, Jock! Are ye hurtit?" says Private McPhun. "Ay, Geordie, they've got me; I'm fearin' I'm done. Ye'd best gang and leave me," says Private McPhee. I'm blindit, and that's whit's the maitter wi' me." "If we bide here for lang, we'll be bidin' for deid. If I'd tasted that haggis ma auld mither sent." It's missin' that braw muckle haggis ye've got." We've legs for tae run, and we've eyes for tae see. And we'll baith hae a kyte-fu' o' haggis the nicht." When Private McPhun gruppit Private McPhee. When Private McPhee guidit Private McPhun. "Keep clear o' them corpses--they're maybe no deid! Haud on! There's a big muckle crater aheid. Look oot! There's a sap; we'll be haein' a coup. A staur-shell! For Godsake! Doun, lad, on yer daup. Before the nicht's feenished on haggis we'll dine." There wis havoc and horror on Naebuddy's Land. And the hameless wee bullets were dingin' the air. When the stutter and cluck o' a Maxim crept roun'. And McPhee on his back kept a bonnie look-oot. I can hear the braw sweerin' o' Sergeant McCole." Wi' a sab and a curse fell his length on the grun'. "Jist think o' the haggis! I smell it from here. It's steamin' for us, and we're--jist--aboot--there." Then Private McPhun answers: "Dommit, auld chap! For the sake o' that haggis I'll gang till I drap." And onward he staggers in passion and pain. Till you'd think they'd jist taken a' hell on a lease. The lads o' the Hielands are bringin' them in. Hoo they rave aboot haggis?" says Sergeant McCole. And they a' wonnert why he wis greetin' sae sair. And it--dropped on the haggis and dinged it tae hell." And on through the nicht like a torrent they swept. On, on, wi' their bayonets thirstin' before! On, on tae the foe wi' a rush and a roar! For he thocht o' the haggis o' Private McPhee. Remember to puncture the sown sheep stomach before boiling or it may explode spreading suet, oatmeal and various ovine tissues around your kitchen. "This game is not in any way endorsed by the Royal British Legion." In the second part of my investigation into the way that computer games have portrayed the First World War, I look at a game that attempted to portray the irony of war by using icons of World War One and instead dramatically backfired into a moral panic about the lessons taught in computer war games. War games are fundamentally about killing people. For this reason, they are often the subject of intense scrutiny by the media, not so much for their historical accuracy but for their perceived violence towards their fellow men. Most games, such as the Medal of Honor series try to offset this; the MoH series of games give historical detail (files, images, veteran testimonies) as a reward for completing levels, for example. Overall, however, the political and social consequences of fighting a war are avoided in computer games; the battle ends when the objectives are met, not when the truce is signed or war dead buried. 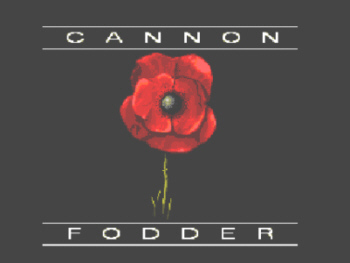 In 1993 Sensible Software released Cannon Fodder, launching it (probably coincidentally) at a games show in London's Olympia from November 11 to 14, across the Remembrance Sunday weekend. The object of the game was to complete a series of tactical missions using a small team of soldiers by directing them with the mouse and giving them orders. The game was revolutionary in several ways. It was the first game to have such developed soldier units, visible to the human eye as men, and it was the first game in which, if the player clicked upon these units, the soldiers would respond with a cheery greeting or comment. The soldiers had names, too, the first being the nicknames of the programmers themselves 'Stoo', 'Jules', and so on. Overall, these men were personalised to the player, and the more missions they accomplished, the more skilled they became. Thus, on several levels it was a good idea to keep your men alive. However, the game introduced several other ideas that did not fit as well into the idea of a computer war game. As well as their cheery greetings, the soldiers did not always die when they were hit by the enemy (or, indeed, by friendly fire). Instead, if they were seriously wounded, they would scream until either put out of their misery, or they expired on their own after a certain amount of time. Finally, when men died, the player saw them on the 'game over' screen as a series of names and a small hillock on which lay a corresponding number of graves. 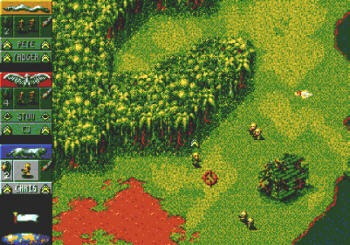 Quite simply, Cannon Fodder reminded its players what they were doing. It tried to reproduce the irony of war within a computer game framework, most notably by showing the players the consequences of their actions - death. It parodied the wargame, quite deliberately, by reminding the player that when she played, that war itself was 'fun'. The use of the poppy in particular was seen as a vast slur on the remembrance of the dead. Sensible Software were forced to change the cover to the game and to add the comment above that disassociated the game from the British Legion (who sell paper poppies as images of remembrance). Here is the revised cover for Cannon Fodder - more 'cartoony' and less of an obvious historical background. Cannon Fodder probably did go too far (see for example the video that went with the release of the CD32 - below), but the sad thing is that it remains one of the only games to challenge its audience about the consequences and ideas of warfare. At the same time, Sensible Software's satire on the institution of both war and war gaming is one that still effectively conveys a vastly ironic message. The First Balkan War began in 1912 and ended in 1913. It was fought over the European territory controlled by the Ottoman Empire. Serbia, Bulgaria, Greece and Montenegro battled the Turks until all that was left of Ottoman European holdings was Constantinople. The ever-helpful Brassey's Guide To War Films lists three movies about this bloody prelude to the Great War. In 1915 Cecil B. DeMille released The Captive, starring Blanche Sweet as Sonya the Montenegrin peasant girl who falls in love with Mahmud (House Peters) the Turkish captive in her village. Pascali's Island (1999), written and directed by James Dearden, covers the years preceding the war. It stars Ben Kingsley as Pascali, a spy for the Turks, Charles Dance as an archaeologist, and Helen Mirren as an expatriate artist. In 1945 RKO released the Val Lewton production of Isle of the Dead, directed by Mark Robson, also set in the period. Lewton was born in Yalta in 1904. His grandfather had been a chemist who had served Tsar Alexander III, and his aunt was the actress Alla Nazimova. A successful journalist and writer, after his book The Cossack Sword was published, Lewton was hired by David Selznick to work on a proposed production of Taras Bulba. After nine years as a story editor with Selznick, Lewton went to RKO as a producer, where he created a series of remarkable black-and-white low budget horror films that were filled with psychological terror and shocks without being overtly bloody. Lewton could call upon the resources of the studio and worked with very talented collaborators many of whom would be well-known in the film noir genre: Albert S. D'Agostino (Art Director), Nicholas Musuraca (Cinematographer), Jacques Tourneur, Robert Wise, Robert Rosson and Mark Robson (Directors). His little "B" films were also very successful. The Cat People (1942) cost about $134,000 and grossed more than $3,000,000. As a child, Lewton had been fascinated by Arnold Böcklin's gloomy painting Isle of the Dead. 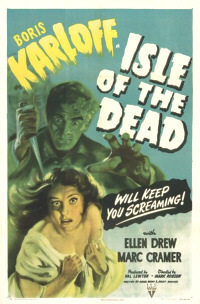 Production on the movie Isle of the Dead started in July 1944 but was interrupted due to Boris Karloff's back problems. It eventually was restarted in December 1944. The screenplay by Ardel Wray and Josef Mischel (rewritten by Lewton) tells how during the Balkan War a group of people are isolated on a Greek cemetery island due to an outbreak of plague. As they succumb one by one, General Pherides (Boris Karloff) begins to believe that a "vorvolaka" is at work. A "vorvolaka" is a vampire that consumes the life force of its victims. Torn between a belief in rationality and superstition, and dying of the plague, he tries to destroy the young woman he believes the evil spirit inhabits. Madness and murder take over when one of the group, Mrs. St. Aubyn (Katherine Emery), suffers a premature burial. Heavily influenced by both Poe and Freud, Isle of the Dead builds to a horrifying climax. Film critic James Agee called it "as brutally frightening and gratifying a horror movie as I can remember." According to one exhibitor, "The first part of the picture is boring, but the last part had my patrons screaming and shouting their heads off." Isle of the Dead was banned in Britain until 1956. When finally released it received an "X" certificate. 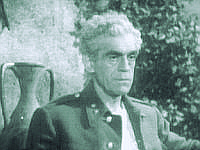 Karloff in Isle. . .
Boris Karloff was working as an actor in 1917, playing Trampas in The Virginian. The stock company arrived in Los Angeles in December 1917. In 1918 the influenza epidemic broke out and effectively ruined the touring theatrical business in the West. Karloff worked as a day laborer before starting in movies as a bit player. The Val Lewton Horror Collection was released on DVD in 2005. In addition to Isle of the Dead, it includes Cat People, I Walked with a Zombie, The Leopard Man, The Seventh Victim, The Ghost Ship, The Curse of the Cat People, The Body Snatcher, and Bedlam. It also includes commentaries, trailers and a documentary on Val Lewton. Isle of the Dead is also available as a double bill with Bedlam, also starring Boris Karloff. I recommend going for the complete collection. The following are thanked for their contributions to this issue of the Trip-Wire: Susan Neeson, Thomas Jones, Pete Guthrie, Tom Jones, Donna Cunningham, Sidney Clark, Frank Womble, Bob Ford, Fred Rutledge Tony Langley, Regina Zimmermann, Christina Holstein, Tony Noyes, Esther MacCallum-Stewart, Andy Melomet, Kimball Worcester, and Len Shurtleff. 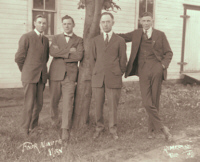 The photo of the Four-Minute Men was found at the Rimersburg Library website. Until next month, your editor, Mike Hanlon.